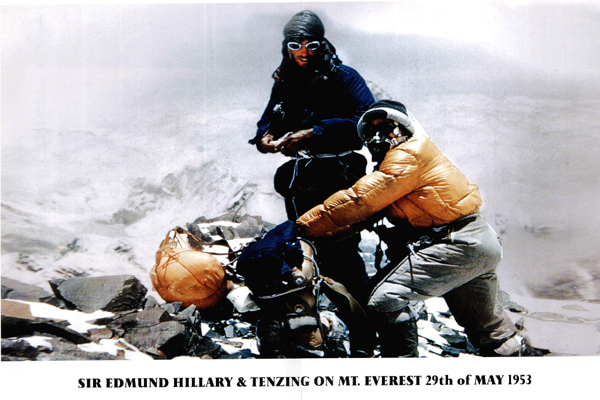 Why not join us in the Diamond Jubilee celebration of Sir Edmund Hillarys conquest of Everest in May 1953. To mark the special Diamond Jubilee celebration year, we are running two options all throuout this year 2013: a fourteen day trek flying in and out of the mountain airstrip at Lukla and for those with more time, a twenty six day trek that follows the original route taken by the 1953 expedition. There is a choice of accommodation on trek, people can choose either to camp or to stay at a mountain lodge, wherever possible we will be stopping where the original camps were made sixty years ago. There will also be opportunities to visit some of the school and health projects established by the Himalayan Trust. Sir Edmund Hillary has always been highly respected by the Nepalese, he fell in love with these mountains and the wonderfully hardy Sherpa people who live amongst them. Over the many years since his conquest of Everest until his death, he worked tirelessly to improve the human conditions of the area, especially in the fields of education and health. The Himalayan Trust which he founded in the 1960’s has built 30 schools, two hospitals, and 12 medical clinics in Nepal’s Khumbu region. Sir Edmund Hillary passed away on the January 11th 2008. He does however live on strongly in the hearts and souls of many Nepalese people and in Shambala (A Sherpa / Tibetan term used to depict their belief of the strong spirit that lies within all of humankind, buried somewhere deep within the Himalayas). If you are thinking of joining us, age is not the most important factor but you need to be reasonably fit. The trek is quite hard at times but the true rewards of the journey are clear to see.When you stand at Base Camp looking up at the highest mountain on earth along with the other great peaks of Cho Oyu-8153m, Lhotse-8516m and Makalu-8463m, you will appreciate that you really are on top of the world. Day 03: Fly to Lukla / leisure / people who opted to walk in from Jiri join group. Day 21: Transfer to the airport / for flight to your onward destination. Day 10: Nunthala to Kharikhola 2040m / overnight camp . Day 12: Rest in Lukla / leisure / people who opted to fly in to Lukla from Kathmandu join group. Day 30: Transfer to the airport / for flight to your onward destination.